PHOENIX — Matt Koch outlasted Los Angeles Dodgers ace Clayton Kershaw his previous start. Next up was Houston Astros star Justin Verlander. Two MVPs in consecutive starts would be a daunting task for any pitcher, much less one with 12 career starts under his belt. Koch never blinked — and accomplished a rare feat. Koch outpitched Verlander to become the first pitcher to beat MVPs in consecutive starts in at least 71 years, lifting the Arizona Diamondbacks to a 3-1 victory over the Houston Astros on Sunday. Koch’s reward after beating Kershaw was a start against Verlander, becoming the first pitcher since 1947 to face different MVPs in consecutive starts. Just like he did against Kershaw, Arizona’s 27-year-old right-hander did not let the moment get to him. Koch gave up a solo homer to Alex Bregman in the second inning, but shut the Astros down after that, escaping a jam in the sixth to get the MVP sweep. Verlander (4-1) was sharp early, racking up strikeouts to move up baseball’s all-time list after fanning 14 his previous start. The Diamondbacks finally got to him in the sixth, when A.J. Pollock lined a run-scoring triple and was awarded home on an obstruction call after getting tangled with Bregman on a wild throw to third. “We grinded out some really good wins against, that’s probably the best staff in the league and they’re hot right now.” — A.J. Pollock. The loss was Verlander’s first in 12 regular-season starts and his first with Houston (9-1) since an in-season trade from Detroit last year. Pollock added a run-scoring single off Joe Smith in the eighth inning and Brad Boxberger worked around two runners in the ninth for his 11th straight save for the Diamondbacks, who have yet to lose a series this season. Koch beat Kershaw his previous start by giving up three runs and four hits in five innings. The right-hander’s road didn’t get any easier on Sunday. In facing Verlander, Koch was the first pitcher to face different MVPs in consecutive starts since the Chicago White Sox’s Ed Lopat went against Detroit’s Hal Newhouser and the St. Louis Browns’ Dizzy Dean in 1947, according to STATS LLC. Dean, a former St. Louis Cardinals ace, had been out of the majors for six years when he came back to make that one final start for the lowly Browns, on the final day of the season. After a triple and HBP to start the #Astros 5th, Matt Koch strands the runners with a strikeout and this inning-ending 6-4-3 double play. Koch was sharp early other than Bregman’s solo homer and induced an inning-ending double play after Houston had runners on first and third with no outs in the sixth. Arizona’s Paul Goldschmidt has been in a rut. The five-time All-Star first baseman went 0 for 4 against the Astros on Sunday and is hitless in his last 23 at-bats. Goldschmidt went 1 for 25 on the homestand, dropping his average to .225. Verlander entered Sunday’s game tied with Jack Morris for 35th on baseball’s all-time strikeout list with 2,478. He moved him past Morris and Bartolo Colon (2,479), pulling into a tie for 33rd with Don Drysdale (2,486). Diamondbacks RHP Shelby Miller is expected to throw two innings in an extended spring training game Friday in his return from elbow surgery. He first will throw a bullpen session on Tuesday. 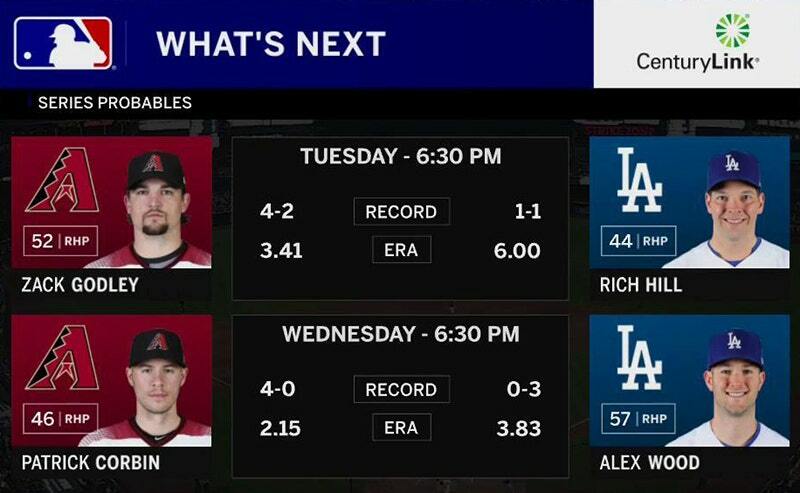 Diamondbacks RHP Zack Godley is 2-3 with a 3.92 ERA against the Los Angeles Dodgers headed into Tuesday’s start against them.